I have been nibbling on a wheel of Irish Cashel Blue cheese for a couple of weeks now. It's creamy, almost buttery texture, and it's delicate, green Roqefortii-veins have a way of beckoning me to snag a crumble and let it melt into a primal, musky puddle on my tongue. Much to the chagrin of the other inhabitants of my home. Aka, the family. The only ones in my house whose senses trill at the presence of blue cheese are me ...and the cat. But that's not all bad. That means that I wasn't batting off advances toward my wheel of Cashel Blue as I tossed around recipe ideas and commenced testing. Mine. All mine. Though in all honesty, it would be nice to share. 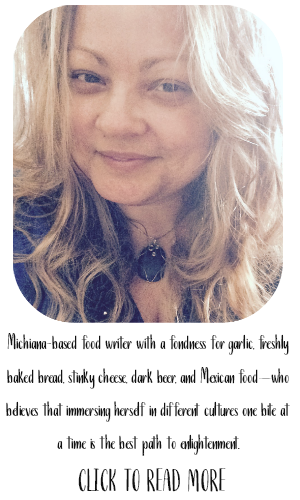 So yes, I've been working on developing a recipe. 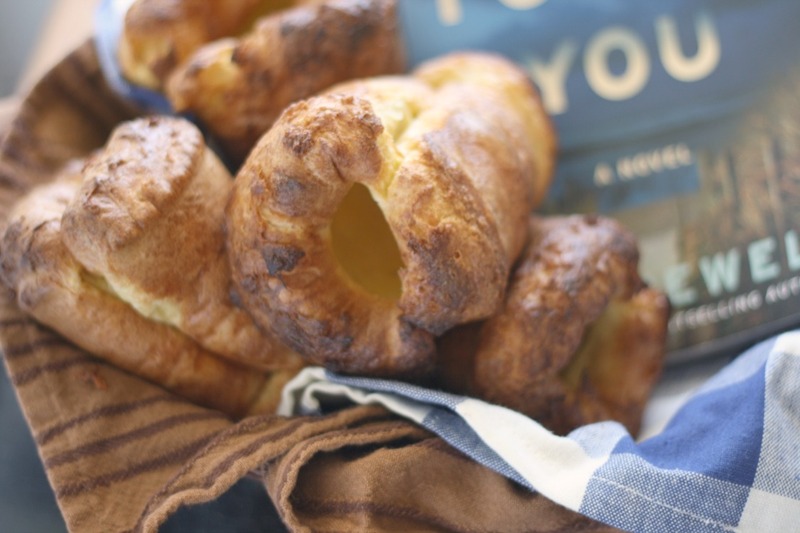 More than that, developing a recipe that perfectly flaunts the attributes of Cashel Blue. 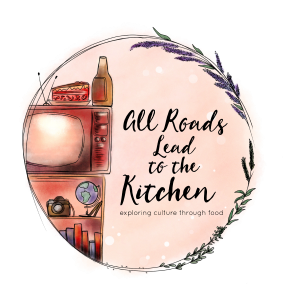 From cheesecake to quiche, from burgers to ice cream, from bread to pungent, creamy sauces - I worked through a plethora of thoughts and recipe formulations. Even a batch of Cashel Blue cheese dressing is on the horizon. 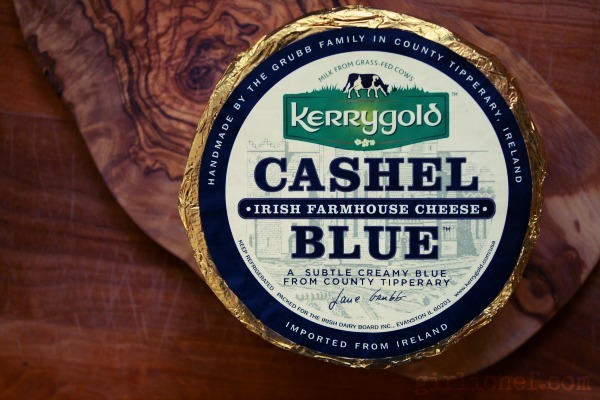 From simple to "involved", Cashel Blue lends itself to a world of delicious applications. But in the end, the idea that won out...the one that I could not get out of my head until it came to fruition, was savory shortbread. I mean, that buttery, creamy texture and tone of the Cashel Blue that is given to it in part by the lush Irish grass that their cows graze on, marries perfectly with the golden Kerrygold butter which shares that similar characteristic. And I had already decided that I wanted something that would pair well with whiskey (Irish or otherwise). 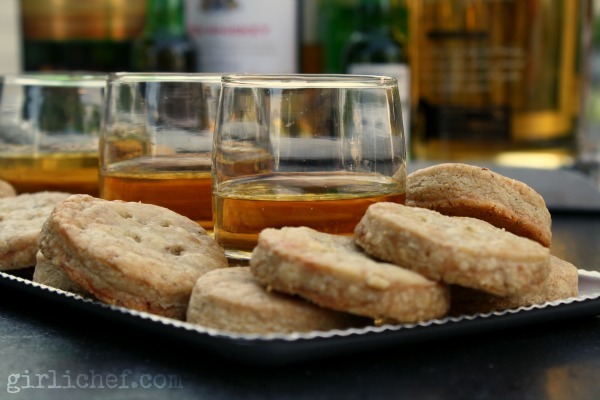 You can taste the distinctive, mild flavor of Cashel Blue in every bite of these savory little rounds of shortbread, which is rounded out nicely with the meatiness added by the addition of hazelnuts, and the bite of black pepper. 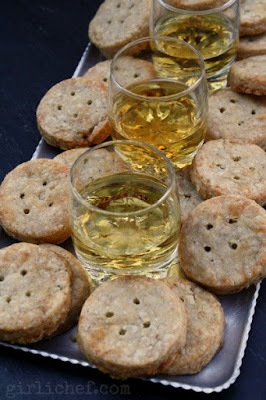 Rich, buttery, and perfectly crumbly, it makes the ideal accompaniment to munch alongside whiskey (or whisky) - whether alone, or as part of a tasting of various whiskies. On a side note, as the shortbread was baking, a glorious smell permeated the air in the kitchen. As I sat back next to an open window with sunshine streaming in, my feet kicked up, I was thinking about how amazing the kitchen smelled. One minute later, my daughter walks through from outside and says "Ugh, it stinks in here!". Followed not long after by an older brother who just made a face and a noise. And a younger brother who held his breath every time he dashed in and out of the kitchen for the next two hours. Ha! 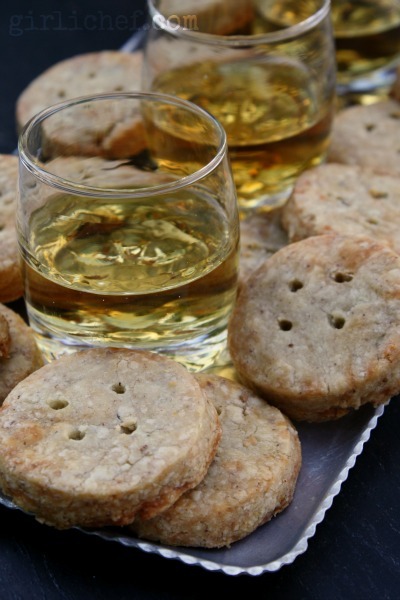 This savory shortbread infused with blue cheese, hazelnuts, and black pepper makes the perfect accompaniment for a whisk(e)y tasting. In a medium-sided bowl, cream together the butter and blue cheese until smooth. Add the remaining ingredients and beat until everything is combined, and no spots of dry flour remain. 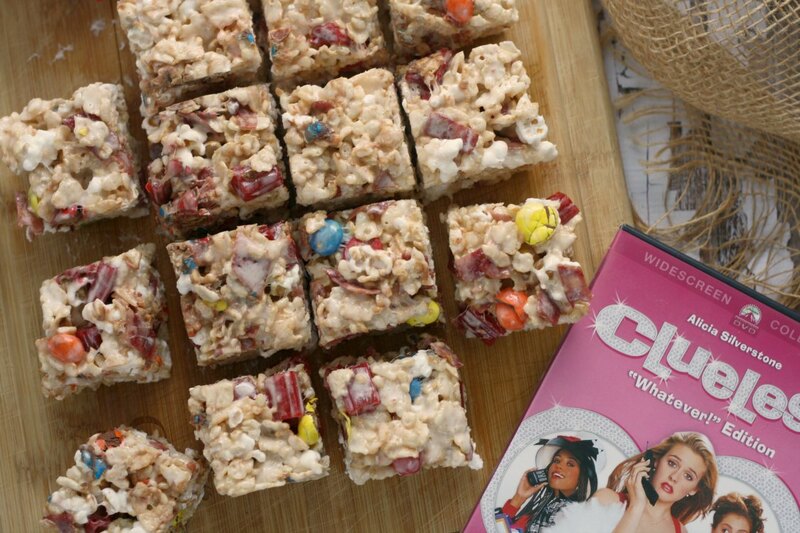 The mixture will be crumbly like a streusel topping - don't worry, that's perfect. Lay a large sheet of plastic wrap out on your work surface. Tip the bowl and pour the mixture out onto the plastic. Use the sheet of plastic to gather and pat the mixture together, until you have a rectangular "block" of shortbread dough that is about an inch thick. Wrap the plastic around it and refrigerate for at least 1 hour, or up to 3 hours. Lightly flour your work surface. Remove the dough from the plastic and set it on your prepared area. Lightly dust the top with a bit more flour to keep it from sticking to the rolling pin. Use a rolling pin to gently roll the dough until it is 1/4-inch thick. 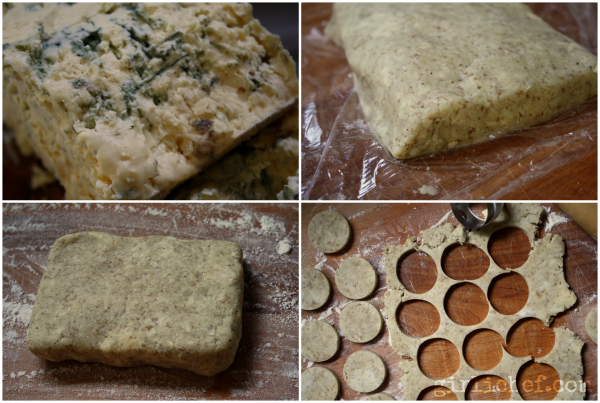 Using a cutter that is approximately 1½-2-inches, cut circles from the dough. Gather up the scraps and re-roll or pat them out again. Repeat process until all of the dough is used up. If you like, poke a few holes about halfway down the dough, for decoration. Set the dough onto the prepared baking sheets, leaving about an inch between each. Place the sheets into the freezer for 15 minutes. Transfer the baking sheets from the freezer to the preheated oven. Bake for 23-25 minutes, or until the shortbread has started to turn golden; rotate the pans from front to back and top to bottom halfway through baking. Allow to cool on the baking sheet for about 5 minutes before carefully transferring to a wire rack to cool completely. 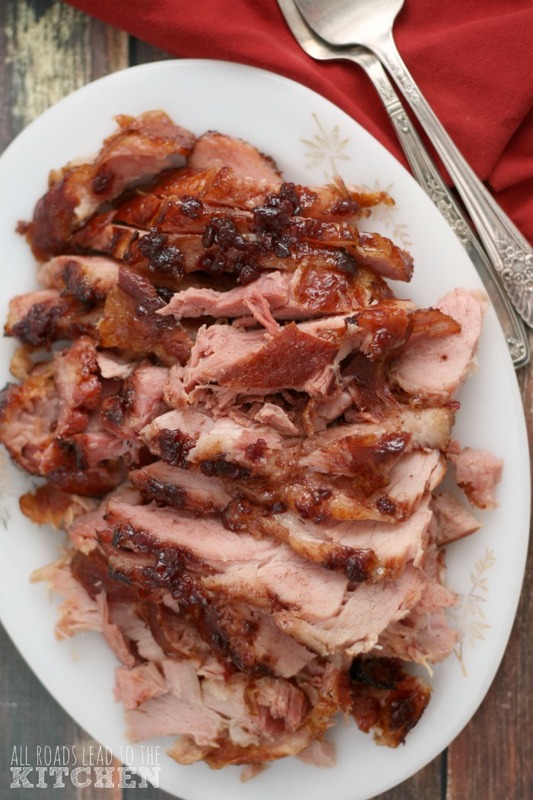 Once completely cool, store in an airtight container at room temperature, for up to 3 days. I think these would be equally good using pecans or walnuts in place of the hazelnuts. 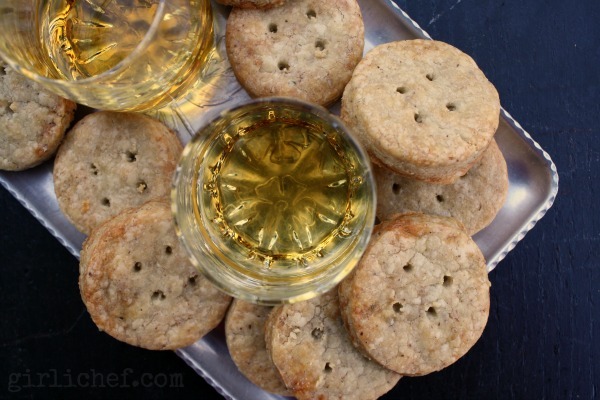 I think that the ABSOLUTE perfect use for this savory shortbread, is served alongside whisk(e)y. Set them out with other munchies like sliced apples or pears, dried figs and apricots, smoked and/or candied and/or spiced nuts, dark chocolate, smoked meats, or a some sharp cheddar or crumbly Parmesan. Or serve them alone. 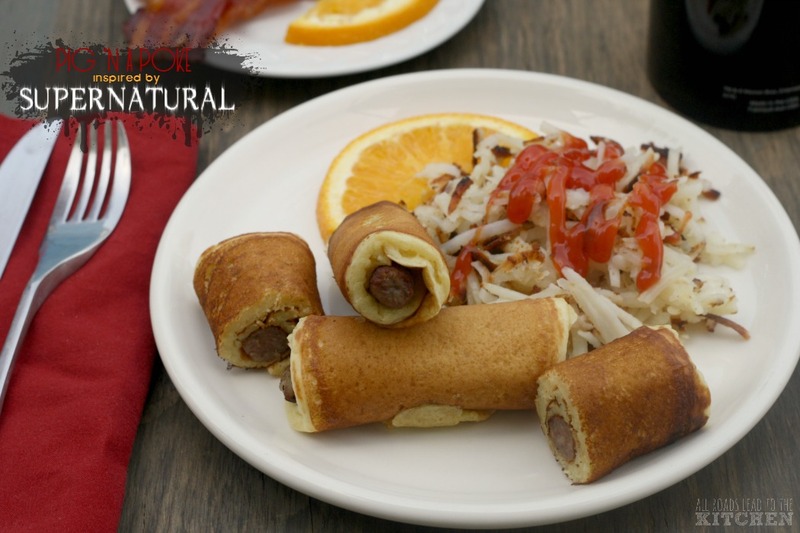 They are the perfect accompaniment to a variety of whiskies. I received a wheel of Cashel Blue from Kerrygold at no cost. I received no compensation to write this post. All thoughts and opinions are my own.